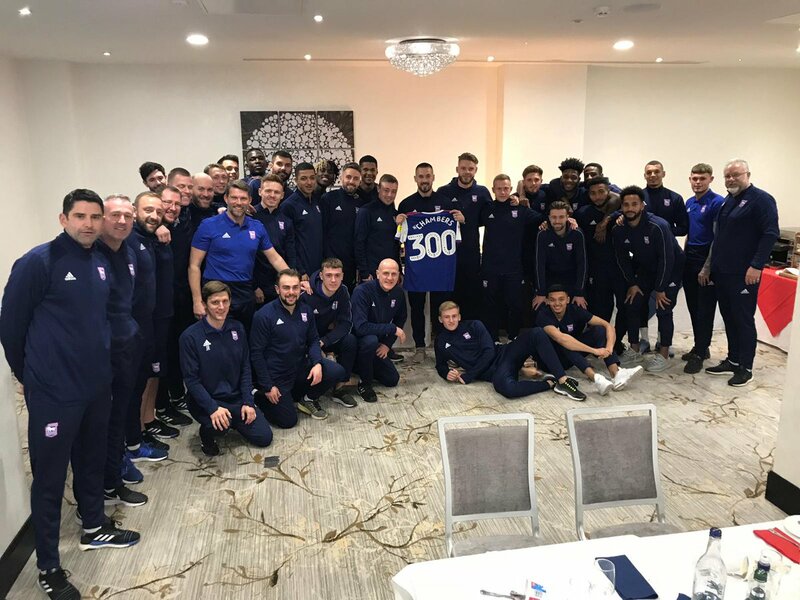 Town boss Paul Lambert presented skipper Luke Chambers with a shirt to commemorate his 300th appearance for the Blues at the team hotel last night with the 33-year old set to hit that milestone at his former club Nottingham Forest today. Chambers, who joined Town on a Bosman in the summer of 2012 after leaving the City Ground, is proud to have played so many matches for the club and so many at Championship level. Today’s match his 435th in the second tier with his one-time Forest team-mate Lee Camp, now with Birmingham, the only player also currently in the division who has played more, 465. “I’m proud of the number of games I’ve played at this level in general. I think it can get overlooked now, the appearances you make,” he told the club programme for Wednesday’s game against Bristol City. “I have been here six years and a bit now and this club has been a massive part of my career, so to play 300 games for Ipswich Town is great. Hopefully there are many more to come. “There have been highs and lows in that time but there always will be. That’s the nature of the game. Reflecting on those highs and lows, he added: “Going top of the Championship on Boxing Day at Brentford in the year we got to the play-offs is a particular highlight. “It all clicked that day. We had a great start, played some terrific football and the fans were amazing. That was a good team we had, perhaps if we’d added to the squad that January, who knows what would have happened. “There is only one thing I’d change in my time here if I could – losing to our neighbours in the play-offs that year. The rest, I’ll take it as it is. “Yes I came here to win promotion to the Premier League and it’s been a disappointment that we haven’t achieved that yet. Nice one, now buck up Chambo. "That was a good team we had, perhaps if we’d added to the squad that January, who knows what would have happened". Confirming what the majority of us believe.If ME had invested at the right time with MM at the helm,there was every chance.It's been all downhill since.Let's hope ME tries to make amends in January. he is very old now..
Well done Chambo. You have shown total commitment to the cause and you are a great example as skipper. Now let's get on and get out of this mess we are in. Onwards and upwards! Well done Chambo.You may not be the greatest footballer,but you are a great captain,and a great person. ......... people still 'assuming' MM asked for player investment that he didn't get. What MM certainly wasn't is a fool - believe me, he was, and still is, a shrewd cookie who's only interest and well being was, and is, his own. Fan pressure through mid table boring football, was what forced Evans hand, not related to any refusal to give MM money to spend on players at all ..... !!! Well deserved Chambo' - never more than an average journeyman defender, but a dedicated professional on every other front for sure. Thank you for your service to the club even though it isn't appreciated by many. We all have off days and too many people forget that all too easily, I would love it if we got a 1 nil win this afternoon from a Chambers header it would be thoroughly deserved. Blueboy - i seem to recall an interview with Clegg years back where they said there was no money for transfers due to debt and investment in academy. I am sure, mick, like any manager would be asking for transfer funds. Whether he chose to spend any available funds is the question??. The predicament we are in is not down to Mick. It is completely Hurst and Evans (this leech is the more culpable) and their summer folly. I really feel sorry for Paul Lambert. Ps. Before i get shot down (which never bothers me) i am not a die hard Mick fan. The 11 headers on the bounce in the 1-1 home draw with Barnsley was clear evidence of his style of football. I just think he was the right manager for tightwad Evans. Shame the football was dire!!!!! Nice guy and good motivator but massively overrated as a footballer. His best days are long gone and it's time we found a replacement.